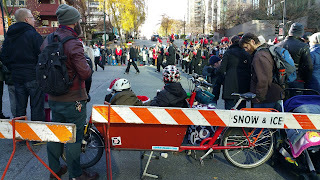 Santa Claus Parade 2016 "box seats"
The holiday season is fast approaching & I've been making a list, checking it twice... of things to do with the kids. I try to focus on the fun activities & family time when our family celebrates Christmas, & not so much on the gifts. They're also at the age where they're really into Christmas & both still believe in the magic, but I know (le sigh) that won't last for much longer. So I'm determined to make the most of the magic this year & take advantage of the many holiday events right here in our backyard. While I was compiling a list of activities that we want to go to or have gone to in the past, I thought I'd share it with you too. Since we mainly get around by bike, I have kept this list to places that are within Vancouver city limits, generally less than a 30-minute ride from home for us. Most of these locations also feature rockstar parking for cyclists--there are generally racks right by the front entrance so you don't have to pay for car parking or dodge SUVs in the parking lot as you walk to the event with your small children in tow! Bonus: more than half the events in my list are free to attend! Scuba Claus at Vancouver Aquarium The aquarium is fun any time of the year, but it's even more exciting during the holidays. 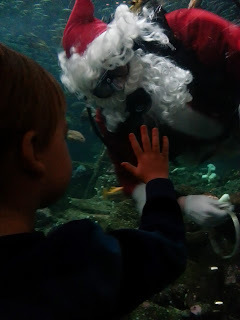 Spot Scuba Claus in with the fish & catch an interactive version of the holiday classic, Rudolph, in the 4D theatre. Stanley Park is easy to get to via the seawall & several of the bikeways through downtown. VanDusen Festival of Lights get your VanDusen tickets online here to save money & skip the lineup. Bike up Heather or take the 37th Avenue bikeway. Bright Nights Christmas Train is on for the 20th year, raising money for the Firefighters Burn Fund. 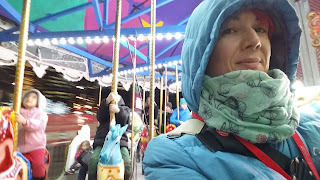 If you don't necessarily want to pay & line up to ride the train, you can always just wander around the lights display with some hot roasted chestnuts or popcorn from the vendors there. Bike the Lights! 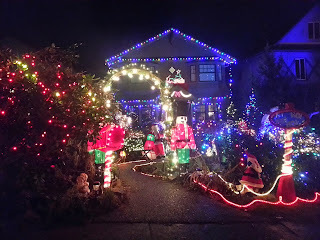 There are quite a few neighbourhoods in the city that vie for the title of best decorated during the holiday season. Keep an eye out on your travels & plan a route near home that takes you through the twinkling lights. Or check out Family Fun Canada's fairly exhaustive list of locations that have good lights displays. PS: though the Trinity Street Lights Festival officially ended, the neighbourhood still goes all out with their lights & decoration displays. Visiting Santa at Oakridge I love looking back at every year's Santa photo & it was something I grew up doing, so we've continued the tradition with our kids. Photo package details & pricing are here. The absolute best Santa is the one at Oakridge Mall. Besides the fact that he's a family friend, he ranks on the lists of best Santas every year from many other families in the city. Oakridge also offers Quiet Days with Santa, a more sensory-friendly event for kids who may get overwhelmed by all the lights & noise. Vancouver Christmas Market Taste a little bit of Germany, right in the heart of downtown Vancouver, in Jack Poole Plaza. The market has been part of our holiday tradition since its inception--eight years now, I believe. It's easy to bike to along the protected lanes downtown & there are usually racks available at a nearby building. Stay tuned: I'll be writing a more complete review of this year's market soon! Vancouver Christmas Tree Lighting December 1st, come out for the hot chocolate, treats, live music, & activities. The event is also a fundraiser for the Vancouver International Children's Festival--so it's a great chance to support another amazing family-friendly event. Christmas at Canada Place Woodwards is long gone, but the holiday window displays live on, inside the halls of Canada Place! It's nostalgic good fun & it's free. Holiday Heights at Bloedel Conservatory is a fun newish event. The view is fantastic from the ferris wheel there & you can warm up inside the tropical paradise of the dome afterward. It's a bit of a hill to bike up, but if the roads aren't slippery, it's doable. Robson Square Ice Skating is free, skate rentals are $4. In contrast to my childhood, where I swear I spent several hours a week on ice skates, my children have barely skated. I play to remedy that downtown at Robson Square this year. Lumiere Festival at Jim Deva Plaza is a relatively new event in one of Vancouver's newest public plazas. Besides the gorgeous light installations, there are performances during the week that it's open--December 2-9 only. Looking forward to seeing this one for the first time! Candy Town is happening in Yaletown, as always, on the 25th of November. This year we don't have any conflicting events, so we might actually make it to see the event. Santa Claus Parade is back for another year, Sunday, December 3 in downtown Vancouver. Bring non-perishable, nutritious food donations to the parade for the Vancouver Food Bank & Telus will help your gift go further by giving $1 for each item, up to $20,000. Are there any other fun events in the City of Vancouver that I've missed? Let us know in the comments! Also: if you're interested in biking with us & other local families to some of these events, join the Vancouver Family Biking Facebook Group--we may post some organized group rides there or you can let people know you're heading out & informally meet up along the way. Nothing more fun than a little "bike parade" of families riding!